"I’m glad to share the State of the Union with Noah, and his powerful story with our state." U.S. Senator Ben Sasse announced his guest for tonight’s State of the Union address. Sasse’s guest, high school athlete Noah Lambrecht, has inspired Nebraskans across the state. “Noah is a remarkable kid and a great Nebraskan,” said Sasse. “He just doesn’t stop. One foot in front of another. He’s got grit, heart, and a contagious attitude. 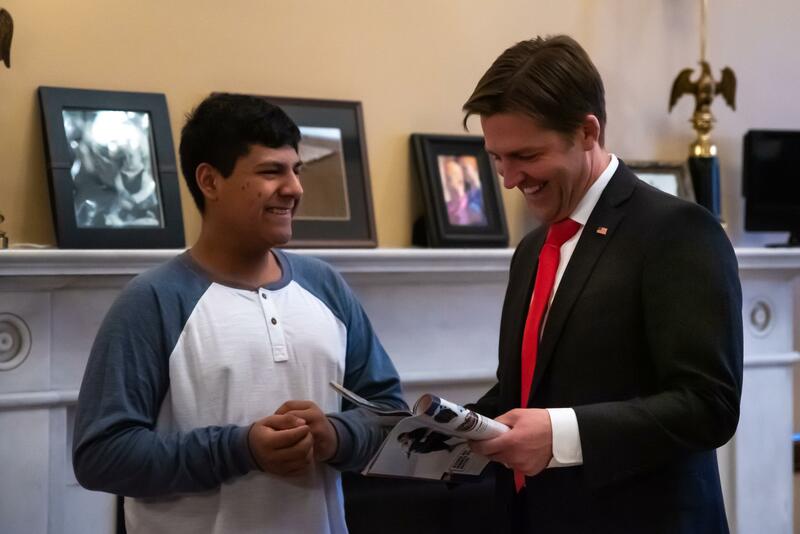 Noah’s story makes Nebraska proud — and that’s why I wanted to invite him to the State of the Union. We should also praise his teammates and the competitors who came along Noah’s side to finish races with him — this is what community is about and the type of stuff that should make all of us proud to be Nebraskans. Noah was born in Chicago with major heart issues and was adopted by Nebraskans as an infant. Despite having multiple open-heart surgeries, asthma, and a pacemaker, Noah competed on McCool Junction’s High School Cross Country team. Because of his medical history, Noah often was the last to finish races. Soon, his teammates and competitors — runners who had already completed the course — would join alongside Noah to finish the race with him. Each member can invite only one guest to attend the President’s address to a joint session of Congress. Sasse’s office has also arranged a tour of the U.S. Capitol for Noah and his family, as well as, a tour of the White House. Previously, Senator Sasse has invited Nebraska State Trooper John Lewis, Paxton farmer Jon Holzfaster, and Dr. Philip Smith, the Medical Director of the UNMC Biocontainment Unit.